ManHandled is run by husband & wife team Matt & Emily Adams. Emily does the art, Matt does the fabrication & they collaborate on all the concepts. They named it ManHandled because Matt committed to helping fulfill every single order when they were planning their shop, making every shipment “manhandled” at some point in the process. About two months ago, Emily overhauled her website & now adds posts daily - everything from recipes to trend reports. Bookmark her site and subscribe to her newsletter for future sales & specials. Start your holiday shopping early! Matt & Emily wanted to create affordable, creative options for teacher gifts that are as fun to give as they are to receive. They created 14 teacher items for you to choose from (7 pairs of earrings for her & 7 keychain & button combos for him). These also make great stocking stuffers for everyone on your list! 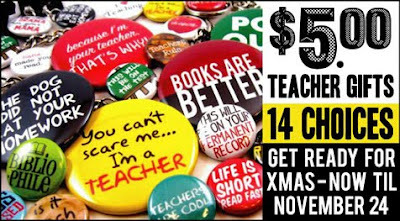 This sale is for a limited time only, so shop now & save BIG on your teacher gifts this year! You will also receive free domestic shipping for the rest of the year as part of ManHandled's pay it forward experiment. *SPECIAL ANNOUNCEMENT: ManHandled is committed to offering free domestic shipping for all of 2011 as well!! You heard it here first!